Most parts of Somalia will remain dry for the next three days, apart from few areas in Puntland and Somaliland where light showers are expected. The rains are expected to spread further in space and time in both Puntland and Somaliland as the week progresses. This will come as a relief to the drought stricken regions especially for pasture regrowth and replenishment of ground water sources. The upper parts of Ethiopian highlands are also expected to receive moderate rains in the same period, this will lead to an increase of water levels along the Juba and Shabelle Rivers inside Somalia. The Central and Southern regions will remain dry during the period in review. This will further exacerbate the existing dry conditions in the areas. 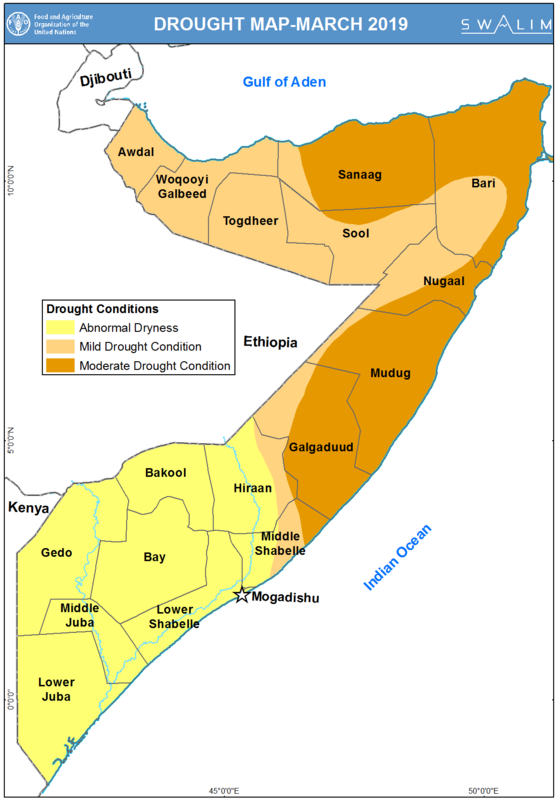 The poor performance of Deyr 2018 coupled with harsh weather conditions in January – March 2019 has left many parts of Somalia facing mild to moderate drought conditions. This has led to serious water scarcity and earlier than normal water trucking across the country and in particular in Somaliland and Puntland. Shabelle & Juba river levels are very low; dried up river beds are seen in some areas. Drought conditions persisted in most parts of the country during the first half of April. Pasture and water are in poor conditions and close to depletion in most areas of key pastoral livelihoods across Somalia. Significant rainfall amounts with good temporal distribution will be required to reverse the current state. The Gu rains normally start in late March in the north western parts of the country and late March / early April in the rest of the country. However, the rains came late in north western regions, and are yet to start in many other parts of the country, which creates doubts among the humanitarian actors in Somalia about the future food security and water availability. Local oceanic systems including the recent cyclones around Mozambique have weakened the rainfall generating mechanism in Somalia and the Horn of Africa in general. River levels increased slightly over the last few days following rains in the Ethiopian highlands. The levels are however below their normal in both Juba and Shabelle rivers during this time of the year. Most parts of Somalia will remain dry in the next three days, apart from few areas in Somaliland and a few pockets in Bay and Bakool regions in the south where light rains are expected. The rainfall forecast for the coming seven days indicates the possibility of more rains towards the end of the week in Somaliland, most parts of southern regions and the Ethiopian highlands. Other areas including Puntland, and central regions will remain dry or receive minimal rains during the coming week. 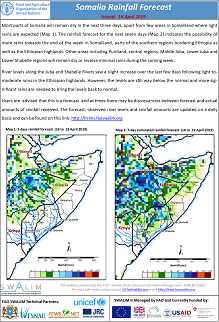 River levels along the Juba and Shabelle Rivers saw a slight increase over the last few days following light to moderate rains in the Ethiopian highlands. However, the levels are still way below the normal and more significant rains are needed to bring the levels back to normal. 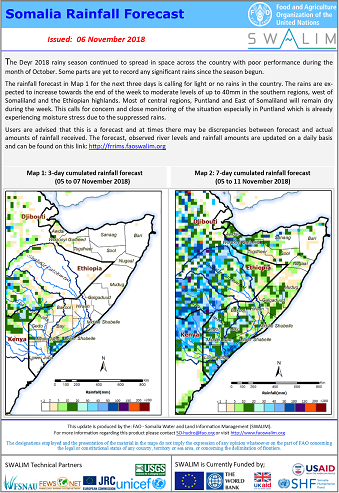 Following a below average Deyr 2018 (October-December) rainy season (Map 1) parts of Somalia are facing abnormally dry conditions, particularly large parts of the central and northern regions. The Deyr 2018 rainfall pattern in these region was poorly distributed in term of space and time. Most stations recorded less than five days of rainfall. The situation is expected to worsen during this Jilaal dry season (January–March) owing to the continued depletion of available water resources in the country until the start of the next rainy season of Gu 2019. The southern parts of the country was dominated by below normal conditions during the same period, However, a few pockets of Bay and and Bakool received slightly enhanced rains during the month of November 2018. The Ethiopian highlands that produce about 90% of the river flow in Somalia experienced depressed rains and this has significantly affected the river flow inside Somalia along the two major Rivers.